"COSSACK", due to the Altmark incident in the waters off the coast of Norway. This action made the Cossack a household name along with the famous cry of "THE NAVY'S HERE!" Others in the class were the MAORI, ESKIMO, MASHONA, GURKHA, AFRIDI, TARTAR, SOMALI, BEDUOIN, ASHANTI, PUNJABI, MATABELE, AND THE ZULU. These ships displaced 1,870 tons with geared turbines on two shafts giving 44,000 shp and a top speed of 36.5 knots. This model is constructed with a plated glass fibre hull, with all portholes and intakes moulded into the hull. To assist in the location of the running gear, the propshaft and rudder exits are marked on the hull. Decks and superstructure are in 1mm or .5mm plastic along with photo exploded views in the instructions to assist in construction. All details are added from the large range of cast alloy and cast plastic fittings included in the kit together with a full running gear set comprising stainless steel propshafts, hard brass proptubes with replaceable bearings, rudder and tiller. Stanchions and ladders are in etched brass to give that crisp finish. 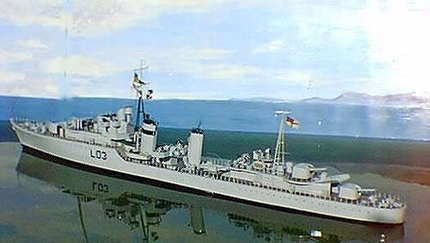 A full size plan keyed to a comprehensive instruction book assist in the construction of this classic model destroyer.